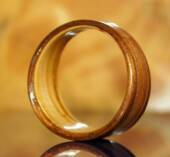 These wedding rings are koa Wood with inset bands of juniper heartwood. The ring on the left (a sz 9) is lined with willow, the ring on the right (a sz 5.75) is lined with birch. Both rings are approximately 10 mm wide and gently tapered.